Oct. 25, 2017 8:12 a.m. 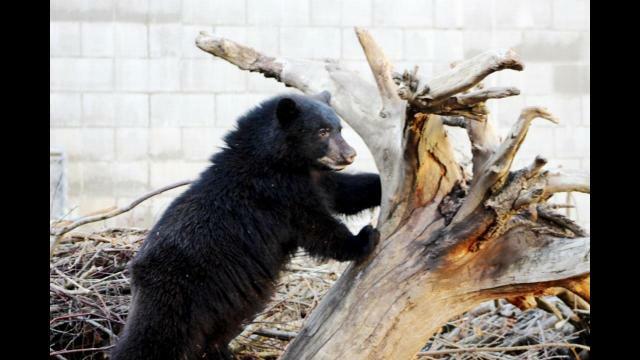 The North Island Wildlife Recovery Centre is once again reminding people to be bear aware. Since June, the Errington centre has admitted five bear cubs. The two most recent bear cubs, from Port Alberni, and one from Black Creek were admitted after their moms became habituated to humans and had to be destroyed, said Tawny Molland, animal care technician at the North Island Wildlife Recovery Association (NIWRA). “Their moms were starting to get into garbage and they were starting to get aggressive, and so unfortunately the COs (conservation officers) had to make that decision to euthanize at that point,” Molland said. Molland said bears are starting to fatten up for the winter. The point NIWRA and other organizations are trying to get out to the public, Molland said, is that people need to secure their garbage. “Don’t put it out the night before, that’s a huge attraction for the bears,” said Molland, adding that people can look into bear-proof containers or store cans in a garage or shed. Molland said people should also pick up any fruit that has fallen off trees. She also said NIWRA accepts the fruits as donations to feed the bear cubs. Molland said the bear cubs will be under the care of NIWRA for another year, until they can be released into the wild next fall. She said the centre typically keeps the cubs for 18 months. The five bears, Molland said, were born around February of this year. Molland said a female cub from Woss was one of the first cubs admitted to NIWRA this year, but the centre doesn’t know the circumstances of what happened to the bear. Molland said the cub is still in intensive care. Her name is Rae. The next four cubs — one from Black Creek, one of Sooke and two from Port Alberni — have been living together in the bear enclosure at the centre. The bear from Sooke, Molland said, was brought to the centre after its mother was hit by a car and was no longer able to car for the cub. Her name is Tim, short for Timbalina. The cub from Black Creek, James, was admitted to the centre after his mother was becoming aggressive. The two most recent bear cubs, Dean and Black Jack from Port Alberni, were brought in on Oct. 11, after their mother also showed signs of aggression. While visitors can’t see the bears in the enclosure, people may observe the bears on a closed-circuit TV at the centre. NIWRA, located at 1240 Leffler Rd. in Errington, is now open year-round. For more information, visit www.niwra.org.